Geeta Hippie clothes. Geeta Bohemian clothing. Artsy clothing for expressive women! Since 1972 Geeta of India has lead the way in creating classic gypsy hippie chick bohemian shabby chic styles for women and juniors. Handmade boutique styles at affordable prices. 100% tie dye polyester peasant gypsy classic long sleeve Kurta blouse with beautiful fancy embroidery throughout the neckline, sleeves, and hem. 5 inch side slits on each side of hemline. This kurta is slightly sheer. 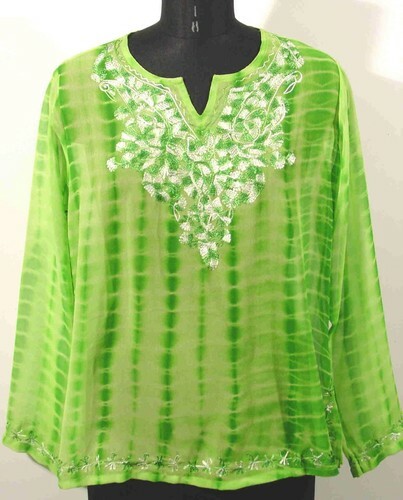 These tops all have a striped tie dye pattern on a solid color kurta. Tie dye patterns might not match the picture exactly. The perfect simple blouse that goes with everything. Check the measurements below.